The Navy Sonar Technician is highly trained in electronics and acoustics of ships, submarines, and oceanographic issues. Interpreting data received from sensitive sonar equipment and sub-surface fire control systems is the main responsibility of the sonar technician. Whether on ship or submarine, the sonar technician is critical to the safety and mission capability of the vessel and crew. To qualify for this Navy Sonar Tech, sailors need a combined score of 222/223 on the Arithmetic Reasoning (AR), Mathematics Knowledge (MK), Electronics Information (EI) and General Science (GS) sections of the Armed Services Vocational Aptitude Battery (ASVAB) test. They need to be able to qualify for Secret security clearance and must have normal color perception and normal hearing. 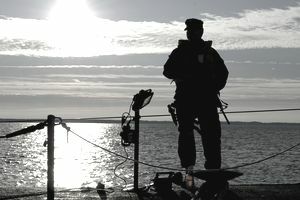 Sonar technicians in the Navy are required to be U.S. citizens as they deal with secret to top secret activities when aboard ship or submarine.